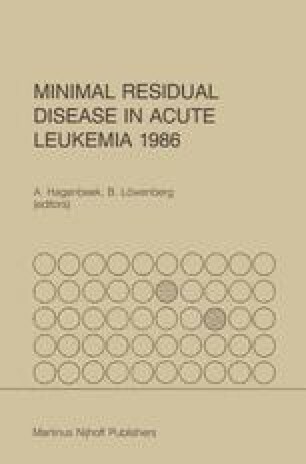 Acute leukemia was the first malignancy to which the principles of adjuvant therapy were applied. In contrast to adjuvant treatment of solid tumors in which surgery and radiation therapy are usually followed by chemotherapy, hematologists used chemotherapy regimens to treat the presenting disease and render the patient free of identifiable tumor (complete remission) then continue to apply post-remission chemotherapy in an adjuvant setting. The response to chemotherapy before surgery and radiation in many solid tumors predicts for duration of survival after radiation and surgery. Likewise, the quality of response to remission induction therapy predicts for duration of complete remission in adult AML.